My sewing machine has been acting up more and more. Sometimes it doesn't stop sewing and I have to hit it a few times. Sometimes it won't reverse and I have to hit it a few times. Sometimes the needle won't stay in the down position and I have to hit it a few times. Sometimes when I ask it to zigzag it sews straight. You can guess how I fix that. Today I was running errands and passed by the sewing machine store. I thought to myself "Oh, I've been wanting to try a few out, I'll just see what they have and what the prices are." I think you all know where this is going! 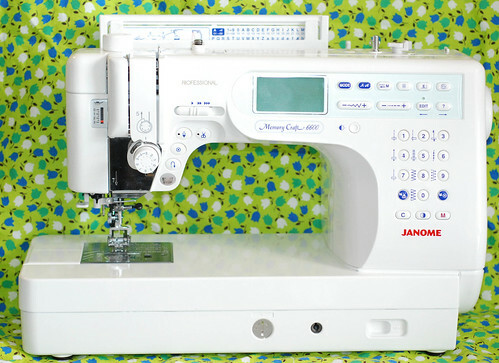 I got a very good deal on the floor model of the Janome MC6600. It came with the quilting table AND an actual table that it sits down in. I couldn't fit the big table in my car, so I took the machine with me today and decided to go back for the table on Monday. I have yet to find space for it at home anyways. So are you all jealous yet?? I pieced 2 quilt backs and was on my 3rd when it jammed! So I took out the bobbin and looked inside and it's clean, no stray pieces of thread or lint. Re-threaded, try again. Still jammed. Exasperated sigh!!! I called right when they were closing and they told me to bring it in Monday. So back to my old machine. Sewing, sewing, sewing, jam! Took it apart, cleaned it, same problem. Clearly the problem is me and every place is closed until Monday. :( I brought the nice new Janome into the living room to look at with the boy and started from scratch. And it works! So I'm going to use it heavily tomorrow and see if the jamming issue occurs again. 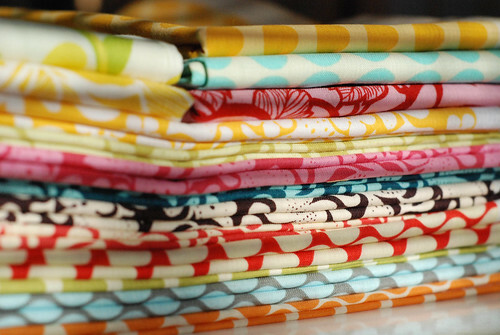 what a pretty stack of fabric! Where did you find the henna garden in yellow? I would love some! oooh ... lucky duck! hope that it was just a weird thing for it to keep jamming and it will be great for you tomorrow. I have Janome Platinum Jem (tiny) and when I get my next one the memory craft is the one I want. I 'll keep an eye out for how you get along with it, no more jamming hopefully! Congrats!! Hey- I meant to tell you that the green w/ white fabric you like @ JoAnn's is back at the San Mateo shop! I was going to text you when I saw it, but don't think I have your #! I am in the market for a new machine so I can't wait to hear how this one works for you. Please keep us posted.